The Fremontcampus opened in September 1974 and is located on a beautiful 534-acre hillside in the southeast area of Alameda County between Highways 680 and 880, just south of historical Mission San Jose. With 300 acres reserved for open space, the campus offers a peaceful learning environment for students. Natural features including black oak,chaparral, and seasonal springs dominate the landscape and welcome wildlife alongside the academic environment. The architecture is designed to complement the hillside surroundings. At the center of the campus are buildings comprising the academic village, with buildings dedicated to music, art, Deaf studies, athletics, and general use classrooms. Additions to the Fremont campus are the fine and performing arts center, the Gary Soren Smith Center for the Fine and Performing Arts (which opened in 1995); the business and technology center, the Morris and Alvirda Hyman Center for Business and Technology (2002); and the Student Services Center (2009), located at the southern end of the campus where the original Building 7 was formerly located. A new core of academic buildings at the Fremont campus will house most of the educational offerings at Ohlone. As a result of the 2012 District Facilities Master Plan it was identified that many of the existing buildings needed to be replaced in order to allow the campus to become more accessible to students as well as meeting current codes and energy efficiencies. Academic programs that will be included in the new buildings include science, arts, general education (math, English, etc.) and learning resources (tutoring, library, study areas, etc.). The new core buildings will replace existing buildings 1, 2, 3, 4,, and 8. Demolition of Buildings 1, 2, and 8 was completed in 2015 to make way for the new Academic Core buildings, and Building 3 was demolished during 2018. A general contractor is currently on site and actual construction has been in progress since May 2016. The Newark Center for Health Sciences and Technology (NCHST) opened in January 2008. The Newark campus is located on Cherry Street west of Highway 880 on a 31-acre site adjacent to the San Francisco Bay. Awarded LEED Platinum Certification, the highest achievable level of sustainability, from the U.S. Green Building Council, the campus serves as a model for other colleges to follow. It is a campus that teaches responsible, sustainable resource management both by example and by intentions. The campus design is tailored to meet the academic and service needs of students on campus, with circulation routes in and around the building to promote student interaction and ease of access. The building has four wings that come together at a central hub. This feature creates a campus commons area with access to the café, computer kiosks, individual and group study areas, and wireless access. The latest educational technology features and ergonomic furniture are found throughout the colorful learning environments. The NCHST offers degree and certificate programs in health sciences, biotechnology, and environmental studies. A variety of courses to meet general education requirements are also offered. The Learning Resource Center (LRC) has two locations, one on each campus. The Newark LRC is located on the first floor of wing 1 in Room NC1124. The Fremont LRC is located in Hyman Hall, first floor. The LRC’s print and media collections are primarily housed on the Fremont campus and are accessible to Newark campus students and faculty through an inter-campus loan system. Registered students may access the LRC’s many electronic resources, including electronic books and periodicals, through the LRC’s web page at www2.ohlone.edu/org/library. LRCs on both campuses provide group and individual study space, access to personal computers, and wireless Internet service. The Hochler Student Center in Building 5 on the Fremont campus houses the Ohlone College Bookstore; Veterans Resource Center; Cafeteria; facilities for the Monitor, the Ohlone College student newspaper; classrooms; and serves as the hub of student activities. On June 17, 1976 Building 5 was dedicated to the memory of the Ohlone Trustee Abraham (Abe) Hochler. Mr. Hochler had served the Fremont-Newark Community College District as a trustee from July 1, 1966 until April 2, 1976, and is remembered for his exceptional leadership in development and construction of the College. He was a staunch supporter of students during his years of service to the District. The Gary Soren Smith Center for the Fine and Performing Arts was built on the Fremont campus to serve student and community needs for a professional performing arts facility. The Smith Center was named in recognition of Dr. Gary Soren Smith, the first Music faculty member hired at Ohlone. Dr. Gary Soren Smith served Ohlone College with distinction for 26 years as a professor of Music, division director, and acting vice president of instruction. Dr. Smith is remembered for his passion for the arts, dedication to supporting faculty and students, and tireless participation and leadership in the development of Ohlone College as awhole. He was instrumental in securing the funds and approvals needed in order to get the Smith Center built. The Smith Center venues contain a 400 seat main stage Jackson Theatre, a 120 seat (flexible) NUMMI studio black-box theatre, a 680 seat open air Amphitheatre, Louie-Meager Art Gallery and shop, a Dance Studio, Scene Shop, 89.3 KOHL radio station, and ONTV television center with two fullyfunctional studios. Known as the largest performing arts center in southern East Bay, the Smith Center showcases student events, shows, concerts, dance productions, club events, and guest speakers as well as talks, lectures, meetings, and other public events. Visit www.ohlone.edu/smithcenter or call the Box Office at 510-659-6031 for more information. With two fully equipped studios and control room, Ohlone College’s Broadcasting Department offers instruction to students for a career in television from instructors who have spent their careers working in commercial television news and entertainment. Students use professional grade Sony DV Cam and Beta Cam cameras and AVID digital editing equipment. The department’s AVID Xpress Elite Non-Linear Editing Suite and multiple AVID DV Editing Bays give students the chance to receive extensive hands-on editing time and to develop editing skills that are in shortsupply in the broadcast industry. The Broadcasting Department’s Live News Production class produces a weekly newscast throughout most of the academic year, broadcast live over ONTV Channel 28 in the cities of Fremont, Newark, and Union City. A Producing and Directing Live Television class is also offered for students interested in the technical side of broadcasting, as well as a Live Production Crew class in which students cover live theatre, sporting, and political events. KOHL 89.3 FM is a commercial broadcast training program focusing on the business of radio broadcasting. KOHLis a 24-hour operation with on-air staff primarily provided by students in a controlled and formatted broadcast lab environment. The station's operational platform is a computer business software program fully integrated with digital broadcasting equipment considered state-of-the-art in the industry. This rigorous program prepares students for a wide variety of positions including on-air talent, production, programming support, and broadcast sales to meet business and industry standards. 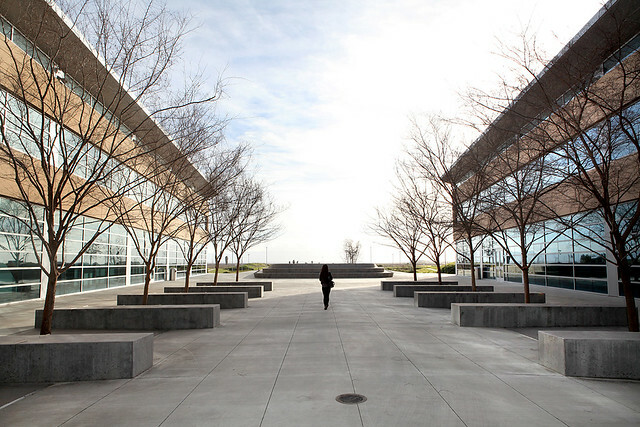 The mission of the Morris and Alvirda Hyman Center for Business and Technology on the Fremont campus is to provide quality, cost-effective education and training for the fields of business, computer science, office technology, and software applications. Hyman Hall serves to advance economic development in the greater Fremont-Newark region. Hyman Hall was named after Morris and Alvera Hyman, the founders of Fremont Bank, in recognition of a significant endowment established in their honor. Prepare students for entry-level, re-entry, mid-level, or advanced jobs requiring a community college education. Assist students in preparing to transfer to baccalaureate degree-granting institutions. Serve as a center for continuing education (upgrading current employees of business, industry, and government). Programs housed in Hyman Hall include Graphic Arts and Multimedia studies. Hyman Hall boasts a seven-to-one student per computer ratio and offers the latest technology in multimedia, business, and other applications. Hyman Hall is a vital economic development asset in the Fremont-Newark region, providing benefits to the entire community. Hyman Hall offers opportunities to prepare for a wide variety of occupational fields. It is also a place where employees can receive continuing education and professional development. By preparing individuals for the workplace and providing continuing education to employees, Hyman Hall is an excellent resource for employers as it offers customized training for companies and organizations. Ohlone College has the largest and mostcomprehensive program in California designed to meet the academic and vocational needs of Deaf and Hard-ofHearing students. Ohlone is unique in that there are both self-contained and mainstreamed courses. Courses taught in ASL include developmental English and math, Deaf education, Deaf culture, personal development, and career awareness. Students may work toward a certificate or associate degree or may fulfill requirements needed to transfer to baccalaureate institutions such as Gallaudet University; National Technical Institute for the Deaf/Rochester Institute of Technology; California State University, Northridge; or other universities. The Deaf Studies Learning Center on the Fremont campus (Building 6, first floor) provides Deaf and American Sign Language (ASL) students the opportunity to engage in intensive language interaction. The lab is fully equipped with Macintosh computer stations with the latest teaching and learning technology available. The computers are equipped with various software packages that allow students to work with video and graphics to create and use projects that improve language (signed and written) and communication skills. In addition to this, tutoring is also available with peer and faculty tutoring. As an important complementary program, Ohlone has one of the largest and most comprehensive ASL/Deaf Studies associate degree and certificate programs in the United States. In addition, Ohlone has nationally recognized Interpreter Preparation associate degree and certificate programs. The large Deaf and ASL student populations at Ohlone allow for a wide variety of extra-curricular activities, including special interest clubs. There are many activities for students within the local and Bay Area Deaf communities as well. The close proximity of the Ohlone College Center for Deaf Studies to the California School for the Deaf in Fremont provides unique collaborative opportunities for Deaf, Hard-of-Hearing, and hearing students. The program is staffed by full-time and part-time instructors, all educated and experienced in the area of education of Deaf and Hard-of-Hearing people. Counselors for Deaf/Hard-of-Hearing students provide assistance with registration; personal, academic, and social concerns; and educational, vocational, and career guidance. The Deaf Studies Division is located in Building 6 on the Fremont campus; more information is available online at www.ohlone.edu/deafstudies. Registration information and appointments with a counselor may be obtained by calling 510-344-5700 (VP) or 510-659-6269 (V). Since its founding in 1864, Gallaudet University in Washington, D.C. has been a symbol of achievements and abilities of Deaf and Hard-of-Hearing people and has provided leadership, inspiration, and exemplary programs for Deaf and Hard-of-Hearing people all over theworld. For some time Gallaudet University has been expanding its scope of services beyond the traditional baccalaureate liberal arts and practical sciences degree. This expansion is in response to the changing needs of society. The Center providesinformation, training, services, and resources to address the educational and vocational needs of Deaf and Hard-of-Hearing people from birth through post-secondary employment; their families, and the professionals who work with them. The Center has a library of books and videotapes for loan. Upon request the Regional Center will assist local communities with planning and coordinating educational programs, workshops, and seminars for Deaf and Hard-of-Hearing people, their families, and professionals who work with them. The Center will utilize resource persons from Gallaudet University as well as appropriate resource persons from schools for the Deaf, colleges and universities, and state and local agencies. Additional information about the Gallaudet University Regional Center may be obtained by calling 510-659-6268 (Voice) or 510-344-5594 (Videophone), or by sending an email to gurc.ohlone@gallaudet.edu. Gallaudet University Regional Center is located in Building 6, third floor on the Fremont campus. The Ohlone College Peer Mentor program offers tours of both the Fremont and Newark campuses. Tours are given by Peer Mentors, who are current Ohlone College students, and provide prospective students with general information about college resources and programs. To schedule a tour please complete a Campus Tour Form, which is available on the Peer Mentors web page at www.ohlone.edu/peermentors/campustours. Tours of the Fremontcampus typically last one hour, and tours of the Newark campus last approximately 30 minutes. Comfortable shoes should be worn as the tours involve a great deal of walking. Please contact the Peer Mentor Office at 510-979-7563 if accommodations (such as a wheelchair or an ASL interpreter) are needed for the tour. If the tour involves more than ten people, or if a customized tour is desired, please contact the Peer Mentor Office by emailing newstudent@ohlone.edu or by calling the Peer Mentor Program Advisor at 510-659-6005. Community Education courses are designed to meet the not-for-credit education needs of individuals in the Tri-Cities area. No tests or exams are required. Courses provide skills, knowledge, and hands-on activities appropriate to the content. Students can improve job skills, prepare for promotion, or explore new careers by taking not-for-credit workshops. Many courses are available online. The Ohlone for Kids and Teens program has special courses designed for students going into grades 3-11. Students practice critical thinking skills and enjoy a variety of activities including arts, computers, math, reading, and writing. The Community Education program is self-supporting and receives no taxpayer funding. Visit the Community Education web page at www.ohlone.edu/commed or call 510-979-7590 for information. For over 20 years the Study Abroad Program has been part of the instructional offerings at Ohlone. Throughout this time, Ohlone has offered students the opportunity to study and travel in a wide variety of countries. The Study Abroad Program has included programs offered by the Art, Business, English, Language Arts, Music, and Theatre and Dance departments. Ohlone students have studied art in Italy, French in Paris, and business in Shanghai; attended theatre in London; cruised the Nile River in Egypt; performed in Europe and Asia; and spent semesters abroad in Stratford-upon-Avon, England and Sydney, Australia. More information about Ohlone’s Study Abroad program is available at www.ohlone.edu/studyabroad.